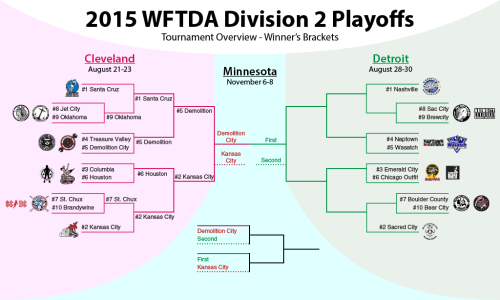 WFTDA Division 2 Playoffs: Detroit Also Rocks! From one music city to another, the D2 ferry crosses Lake Erie and docks in Motown, unloading 10 more team previews. WFTDA Division 2 playoff derby is something, isn’t it? Like last year, the opening tournament of the year featured a boatload of competitive games. Some of the numbers from Cleveland: Five bouts finished within 13 points. Of those, there was a 4-pointer and two 1-pointers. Three out of these five super-tight finishes happened all in a row during the last day of competition. Not too shabby! Last weekend wasn’t without controversies—the “illegal” ending of the Jet City/Columbia game, a 14% increase in penalties, and a loooooot of unsuccessful official reviews were notable happenings. But since we’re a little behind schedule when it comes to how many nail-biting finishes there were in D2 compared to 2014, chances are good that the games happening this weekend will be even better than they were in Cleveland. Our updated overview bracket for Division 2. Remember, the tourney runners-up from both Cleveland and Detroit still have a chance at the D2 Championship title! Our Division 2 playoff preview continues with a rundown of the Detroit, Mich. bracket. Ten more teams enter into a battle that looks to be a much tougher one than last weekend. Flat Track Stats rankings put a sizable chunk of the field higher up and closer together, so expect a lot of fierce games right out of the gate. 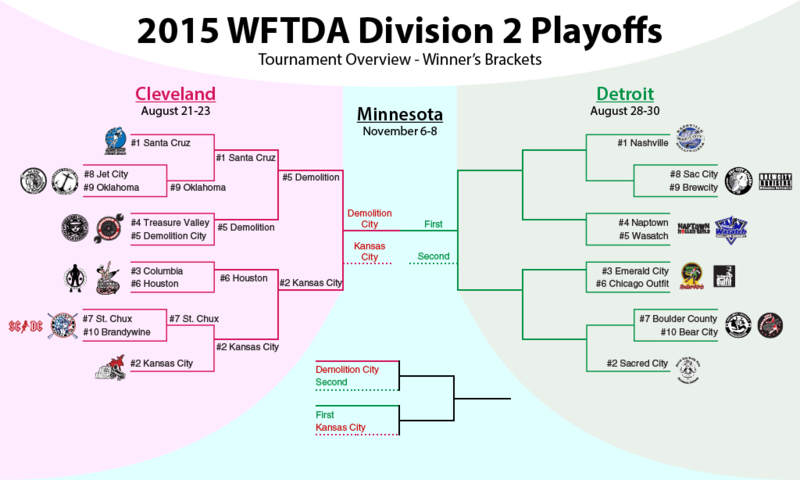 The full Detroit bracket and schedule can be had directly from the WFTDA on its tournament page, here. As for the teams playing? Keep reading. Nashville has had an up-and-down 2015—with just a bit too much “down.” They’ll be competing in the Division 2 tournament for the first time this year as a result. The team was the victimized by two opponents on the warpath early in the season. In March, Arch Rival steamrolled them (and many others) by more than 300 points. A week later, Charlottesville—ranked as low as #74 this year before ultimately qualifying for the D1 playoffs—pulled away to upend Nashville by 61 hip-passes. Detroit 4-seed Naptown also beat them by about the same in January. An 0-3 weekend at The Big O in May didn’t help Nashville’s record, but perhaps it helped the team’s confidence. All of those losses were respectable given the competition. (#16 Montreal, -74pts; #27 Terminal City, -60pts; and #25 Helsinki, -7pts) Since then, they’ve sported a 4-2 record, including a 111-pt thrashing of D2 Cleveland runner-up Demolition City four weeks ago. That’s the right way to come into a playoff tournament. After not making it to the playoffs last year, Sacred City is back in the hunt for 2015. They had a very busy season, playing in nine sanctioned games and at least eight unsanctioned games of significance. Of the games that counted, their only two losses were in Los Angeles during Tinseltown Showdown, versus #31 Arizona (-151 points) and D2 Cleveland top seed and eventual third-place finisher Santa Cruz (-2). Many of the wins were strong ones. Detroit 3-seed Emerald City lost to Sacred by 60 at The Big O. Other wins were against teams just outside of the playoff picture: #64 Ann Arbor (+60), #67 Sin City (+206), and #68 Tucson (+35). Sacred’s unsanctioned schedule is noteworthy in a few ways. Two weeks ago, they played (and lost badly to) Texas at Golden Bowl. They also lost to Bay Area’s B-Team by only 6; that’s an improvement over their 17-point loss to them back in April. (Altogether, Sacred City has a 2-3 record against various Bay Area home and travel teams in 2015.) The one unofficial game that is relevant to this preview is their 134-point walloping of Wasatch, who is the 5-seed in the Detroit bracket. We’ll see if Sacred City can keep that level of thumping up during games that really count. Emerald City’s loss to Sacred turned out to be their only of the year, actually. However, that 7-1 record won’t tell you the quality of opponents the team has been facing. Other than a 182-106 win over Cleveland 7th-place finisher Jet City, and the aforementioned Sacred City loss, Emerald has not faced another opponent within the WFTDA top 70, nor have they won a game with a score differential closer than 80 points. In fact, two of Emerald’s wins were blowouts very extreme in nature. Opening the season at Wild West Showdown, the team liquefied Silicon Valley by 300 points and vaporized Bellingham by 400. At the time, the their opponents were ranked #116 and #163, respectively; they now sit at #217 and #196. That’s not much of a test, is it? Those results didn’t do much to move Emerald’s ranking needle—their meteoric rise came in May and June, going up from #82 to #47. Still, lately they haven’t faced much adversity on the scoreboard. That’s got to be seen as a disadvantage coming into a Division 2 tournament, where no lead is safe. How will a team that’s never been pressured, react to an environment that’s nothing but pressure? Another team falling out of the top 40 from last year, Naptown is still in a good position to do some damage in Division 2 this year. The Tornado Sirens have had some rough losses against upper-division teams that were in their rankings ballpark, notably #31 Arizona (-147 points), #21 Detroit (-96), and #34 Ohio (-51). A 186-175 loss to #32 Toronto this past June helped bump Naptown’s ranking up a bit, but by then it was too little, too late for a Division 1 tournament run. The wins Naptown has recorded are more telling of their chances this weekend. They beat Demolition City (+102) in unsanctioned play and St. Chux (+12) in a sanctioned bout, a couple of teams that played and placed well in Cleveland last weekend. Naptown also has a victory over Detroit 1-seed Nashville, beating them 157-90. Though those results happened very early in the year, Naptown is a team that’s more than capable of repeating them come playoff time. Wasatch team has played something of a compressed schedule in 2015. They didn’t play a sanctioned game until May, beating #67 Sin City by 66 points. It then headed for Denver to play in the Besterns tournament, getting pounded by #14 Rocky Mountain by 268 points, Arizona by 103, and #27 Terminal City by 80. Wasatch came right back and did much better against Arizona the very next day, only losing 227-197. However, they proceeded to fall flat against Sin City again in their second rematch of the year, an 81-point loss in June. Wasatch also lost an unofficial game against 2-seed Sacred City by 134 points early in the year, which is a huge gap for near-ranked teams even accounting for the circumstances of it being an off-the record contest. If that’s anything to go by, Utah’s finest has a mighty test ahead of them. Chicago’s second team has had a great year, to the point where the team was flirting with a top 40 ranking. In April, the Outfit beat last weekend’s champ Kansas City, 188-163. At Spring Roll in May, however, the team came back down to earth. KC recovered and took back a 174-123 win on the first day, and on the last day Chicago dropped a pretty big game rankings-wise to this weekend’s 9-seed Brewcity, a 161-158 last-jam squeaker. Other than an unsanctioned defeat to fellow Chi-town residents Windy City, those were the only blemishes on an otherwise positive season. The Outfit has one win against a Division 1 tournament team, a +86 over #40 Tri-City. Playing more games against higher-ranked D1 teams, as many other D2 teams have done, would have been nice. But even without that, Chicago has every reason to like their chances in Detroit. Flat Track Stats has them ranked higher than any other team in this tournament. Boulder County’s only sanctioned loss of the year was to #39 No Coast, a 188-86 game played two months ago. Before that, BCB swept through the two derbyfests they’ve entered: 3-0 at Dust Devil (beating 8-seed Sac City by 12 points) and another 3-0 at Spudtown Knockdown (beating 8-seed Sac City, again, by 79 points). Boulder County also ran into Treasure Valley, last weekend’s bottom-place finisher, winning comfortably. The team’s side schedule had them face off against Denver, Rocky Mountain, and Gotham—or at least, their B-teams. Watered-down teams from of some of the WFTDA’s elite are still pretty damn stiff competitors, however. They easily beat Rocky’s Contenders squad and lost the other two games by give-or-take 35 points. Facing players from a Division 1 league in any context is a good test, but will their grades transfer over to the full-power Division 2 squads Boulder will be up against this weekend? In another co-inky-dink among the teams playing off in Detroit, Sac City’s only two losses of 2015 came against Boulder County. However, a weak schedule saw Sacramento’s second squad play in some very lopsided games. Five of their wins had an average margin of victory of 264 points, including a 506-60 pasting of #141 New Hampshire. (To be fair, NH was ranked #44 to start the season.1) As mentioned before, blowout wins don’t give much useful experience for a Division 2 tournament. That probably doesn’t matter too much for Sac City, who is just glad to be back in the playoffs this year after missing out last year to due roster attrition. Repeating their 2013 effort—a 4th place finish at Division 2 Championships—will be a tall order, but one they’ll happily take on. Holy schedule, Batman! Of the 20 teams across the Division 2 field, Brewcity has played the most sanctioned games this year, 15 altogether. It’s two less than their 17-game marathon season, but still. That’s a meaty calendar! Two their nine wins were of the last-jam variety. Hosting Midwest Brewhaha, Brewcity beat #75 North Star by 5 points in a low-scoring game, 123-118. The previously mentioned 3-pointer against 6-seed Chicago Outfit was the other. These are the types of experiences that are very useful to lean back on this time of year. Had Brewcity wound up in the Cleveland bracket last weekend, it would have had a lot more experience facing the competition, going 2-1 against teams in that tournament. 10th-place finisher Treasure Valley and 6th-place Brandywine lost to Brewcity by about 40 points each, with 5th-place St. Chux beating them by 84. If you still believe in the powers of triangulation, the Bruisers would be good to finish their D2 tournament in the 6th-8th range—just like they did last year. That’s not the disadvantage that it used to be, however. Thanks to the rapidly-growing strength of WFTDA teams in the Eurozone, Bear City has had the luxury of playing against three quality Division 1 opponents. They even beat one, stealing a 152-116 game from #26 Glasgow in April. Their losses aren’t so bad, either—#17 Stockholm won by 143, and #25 Helsinki by 121. But aren’t European teams kind of still a a wildcard? You can never quite tell how accurately ranked or seeded they are until they get out on the track and start playing. If Bear City wants to get back to the D2 Championships, it’s got the toughest route to get there; they’ll be hoping their path through the brackets is easier than it looks. About Bear City, it may be worth to mention that they quite recently (I think about the turn off the year) had a split, and there are now two leagues in Berlin, the new split-off beeing Berlin Rollergirls. I don’t know exactly what the split ‘cost’ Bear in terms of players on their A-team though. Pour one out for New Hampshire. It made Division 1 last year, but has since gone 0-7 and lost all its sanctioned games by an average of 335 points. Oof!